I’ve gotten behind on my blogging again :( But I’m SO excited for all of the cooking I’m going to do over Thanksgiving! Since I’m so behind, I’ll make this a double recipe post just to make it up to you. The first one is a dessert you can definitely have at your Thanksgiving. Yes, it’s pumpkin. Of course. A couple weeks ago, we had a party at our house. I’d been wanting to use my mini cheesecake pan again, so I thought, why not make cheesecake for the party? My roommates said, “WHAT? What kind of college party has cheesecake?! !” The best ones, of course. And everyone appreciated the cheesecake, so I win. If you don’t have a mini cheesecake pan, you can still bake this in a regular springform pan, but scale everything back to 2 packages of cream cheese. 1. Preheat oven to 350F. Grease cheesecake pan. 2. Put Oreos in a food processor until you have fine crumbs. Pour in melted butter, stir. Press about 1 1/2 Tbsp into the bottom of each well in the pan (I found a shot glass works best for this – it’s really difficult with your fingers). 3. Bake crusts for 10 min. 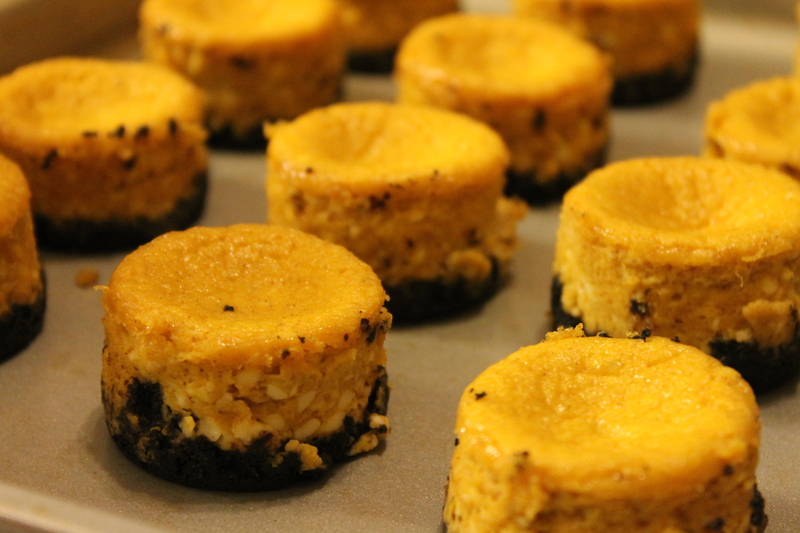 While they are cooling, begin the cheesecake. 4. 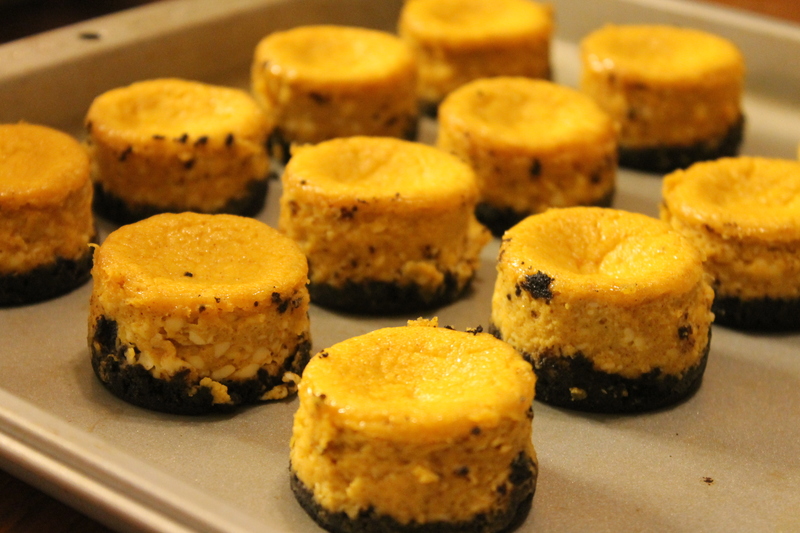 With an electric mixer, combine cream cheese, eggs, pumpkin, and vanilla until completely smooth. 5. Stir in brown sugar, cinnamon, and nutmeg until combined. 6. Pour into each well, filling completely to the top. Bake 20-25 minutes until set. 7. Let cool about 15 minutes then remove from pans. Chill in fridge (or on your porch if it’s cold enough and your fridge is full like mine…) for at least 1 hour before serving. 1. 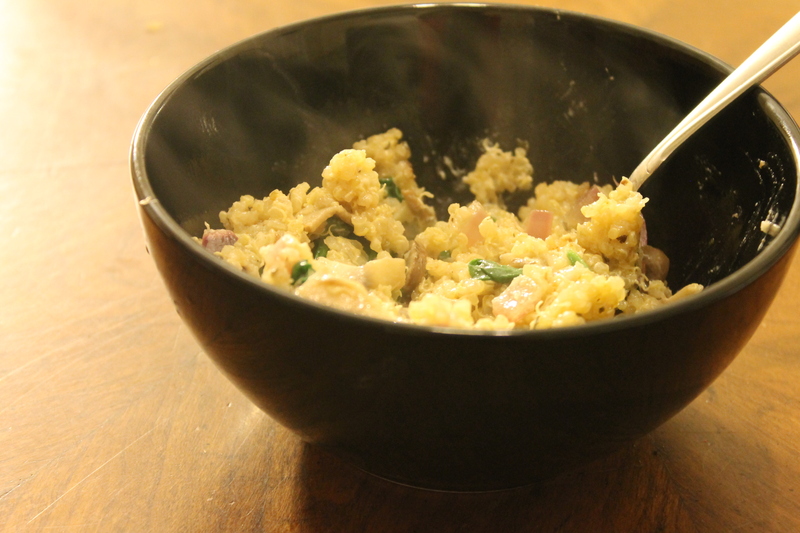 Cook quinoa in vegetable broth, either on the stove top or in a rice cooker. 2. Saute mushrooms and onion in oil over medium heat until onions are translucent. Add quinoa and cook a couple more minutes. 3. Add wine and stir until absorbed. Turn off heat. 4. Add cheese and spinach and stir until cheese is melted and spinach leaves are wilted. Serve immediately. This entry was posted in Cupcakes and Cakes, Dessert, Entrees and tagged cheese, chocolate, cinnamon, mushroom, onion, pumpkin, quinoa, spinach by Alyssa G. Bookmark the permalink.